How did medieval Salisbury people cope with the threat of sin, death, disease, accidents and the prospect of purgatory, heaven and hell? For centuries before the Reformation pilgrims came to Salisbury to make offerings at the tomb of Bishop Osmund whilst seeking medical cures, avoidance of hell and an easier entry to heaven. Indulgences now in the Cathedral archives, offered a reduction of time spent in Purgatory and were granted to visiting pilgrims who made offerings to the Cathedral (and to half a dozen other sacred sites in Salisbury). 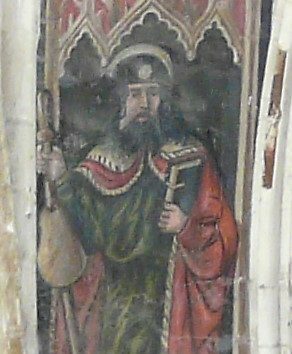 Images of pilgrims may be seen in St Thomas’ Church and on the West Front of Salisbury Cathedral. Many pilgrim souvenir badges that tell of extraordinary journeys, miracles and traditions have been found in Salisbury. Your Blue Badge Guide will walk you through the medieval city, like a pilgrim, pointing out sacred sites, pilgrim hostelries, tales of Saints and sinners and many local miracles. Join the tour and be transported to a bygone era of medieval Salisbury when pilgrimage was part of the culture of the times. Please get in touch via our Contact Us page for more information about this tour.